Right-click the Fills window and click Add Manual Fill. 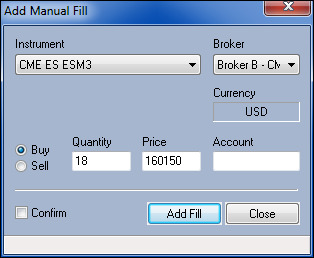 If you execute trades outside of X_TRADER , you can manage those trade using the Add Manual Fill dialog box. Adding trades in this manner lets X_TRADER calculate your true position and P/L (profit/loss). Notes: Manual fills affect only the position and P/L data. 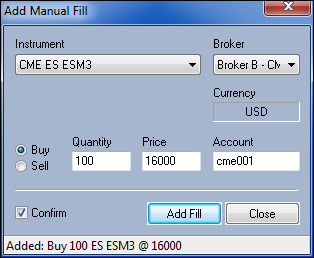 X_TRADER does not provide manual fill information to the middle or back office. Also, for Buy actions, the Add Manual Fill dialog box will be highlighted blue; for Sell actions, it will be highlighted red. The traded product's exchange symbol or contract name. The Broker who filled all or part of the order. Note: You must be logged into a X_TRADER ASP environment before you can select a Broker. Gateway (Non-X_TRADER ASP) The TT Gateway on which the order was filled. Radio buttons to select which side of the order was filled. The price at which the quantity fills. Lets you ensure the fill is correct before adding it to the Fills pane. Sends the manual trade to the Fills pane. Note: This button enables after you complete all mandatory fields. Closes the Add Manual Fill dialog box. Shows the state of the dialog box, including when the manual fill is added to the Fills pane. From the Control Panel, click the Window menu and choose Fill Window. In the Fills pane, right-click an open area and choose Add Manual Fill. Place your cursor on a specific fill in the Fills pane to pre-populate the Add Manual Fill dialog box with information. Open the Add Manual Fill dialog box via the Position pane to have all fields appear blank. From the Instrument field, select a Market, Product Type, Product and Instrument from the Instrument Explorer. From the Broker field, click the Broker (X_TRADER ASP only). From the Gateway field, select a TT Gateway (non-X_TRADER ASP only). The manual fill is added to the Fill window. If you clicked the Confirm checkbox, you must confirm the manual fill. You successfully added a manual fill to the Fills pane. The only way to remove a manual fill is to delete it. They persist even in case of an emergency or automatic shutdown when you lose connectivity to X_TRADER . From the Fills pane, click to select the manual fill trade you want to delete. Note: Manual fills are identified by the m in the Open/Closed (O/C)column. In the Fills pane, right-click an open area and choose Delete Manual Fill. The Fills and Position panes update to reflect the fill deletion. You successfully deleted manual fill from the Fills pane.